Sorry it's been so quiet around here! I promise I'll make up for it with several posts about Austin, which was an unforgettable whirlwind of sweet, stylish ladies and fun, inspiring get-togethers. 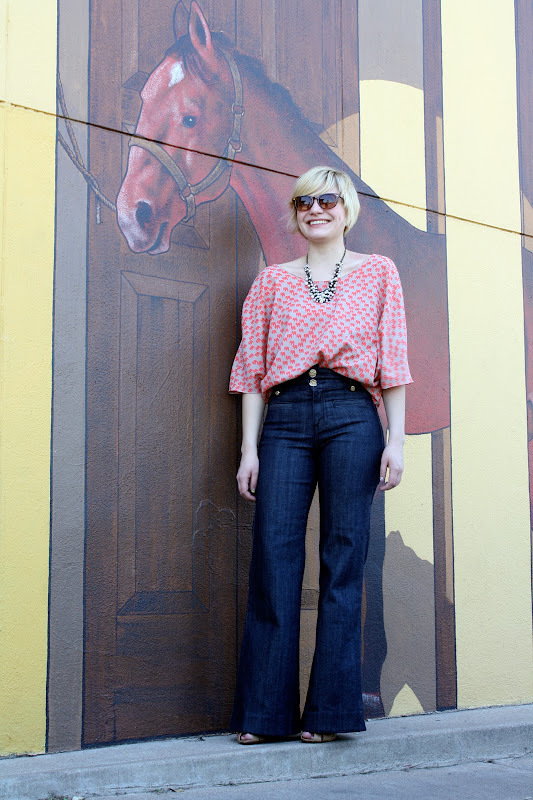 These shots were taken while my roomie Kyla and I strolled South Congress. 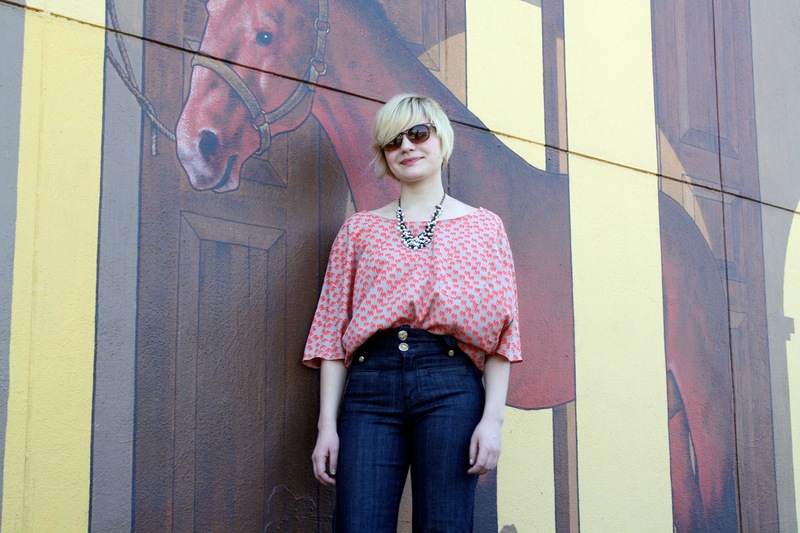 Not only did I find two amazing vintage dresses, but I also stumbled upon my favorite photo background of all time in the form of this horse mural. Coupled with the little elephants on my LuLu*s blouse, this is an aweseomely animal-filled post. Photos taken by Kyla. Animal-filled it is, and I love it! 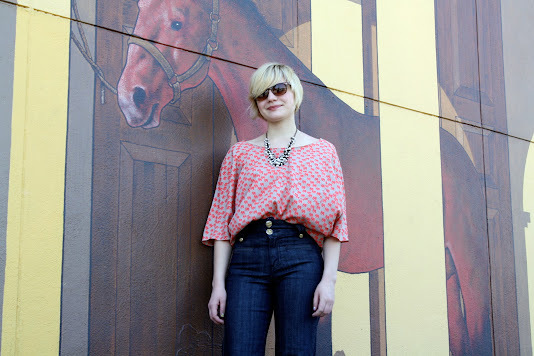 The print on that shirt is amazing, and those jeans fit you perfectly! Our outfit was ever better in person...you are one of the few people I know who can really pull of high-waist jeans. You looked amazing! I so enjoyed hanging out with you at TxSCC. It was so nice to meet you! That shirt was awesome!! Those britches look great on you! Again, it was great to meet you this weekend at TXSCC. Katy! So cute on your blog, even cuter in person! I am sad I missed this outfit in real life, but I'm so glad that you liked Austin. So cute! Love the print on your blouse and the flowy top paired with your high waisted jeans! Beautiful pics and beautiful bloggers. Somewhere I saw a side view of your hair cut...and it is really pretty. i love the way your hair is growing out! You are so gorgeous!! I love your hair, I don't think I've ever told you! The print of your top is amazing. I love your shirt (how cute it has elephants on it) and that backdrop is wonderful. You look so wonderfully relaxed in the last photo. Hope you guys are having fun. 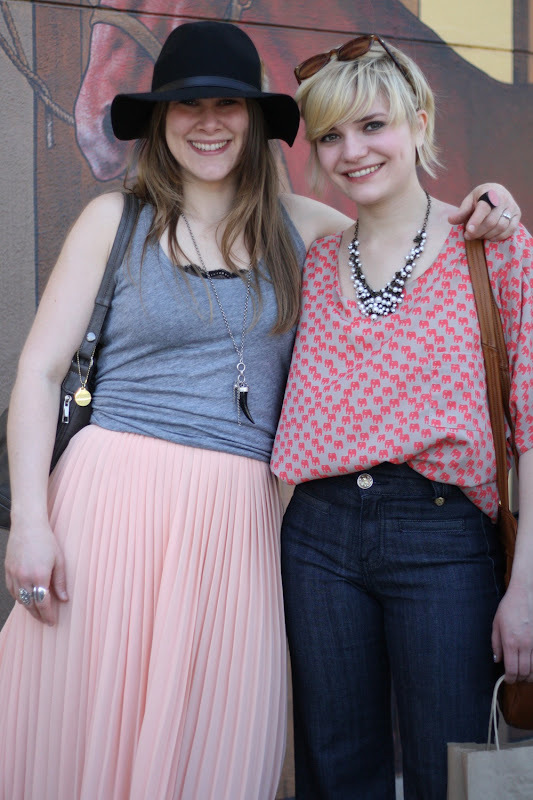 Austin is a great city -- perfect for a fashion blogger meet-up for sure! Looking stunning, as always! I love, love your top! You and Kyla look adorable! Those jeans are incredible! And I might have to get that top for my baby sister. She LOVES elephants! The animal theme is really priceless! That outfit is so flattering! I really don't like wide-leg pants most of the time. But the high waist brought some great definition. Oh you guys... the dimpled duo. I wish we had some more time to talk it up. However, this is a good excuse to get ourselves to the next meet-up. One that may be closer than Texass?